Hello, Firstly let me introduce myself, my name is James Victor Quinton (Jim). I was born in September 1944 and lived at 13A High Road, Laindon for the first 21 years of my life. I was the youngest child of 10 (5 boys and 5 girls) born to Bill and Mag Quinton who were evacuated to Laindon from Canning Town in 1940. The following photograph shows some members of the 1st Laindon Boys Brigade company at summer camp in Weymouth, Dorset, in I believe 1960. Does anyone know the two missing names ? The reason for this photograph is to help with the War Memorial campaign to stay in Laindon, as I can remember marching with the brigade from Langdon Hills Baptist Church to the British Legion Hall next to the Laindon High Road School on Rememberance Sundays and I support the campaign for the War Memorial to stay in Laindon. 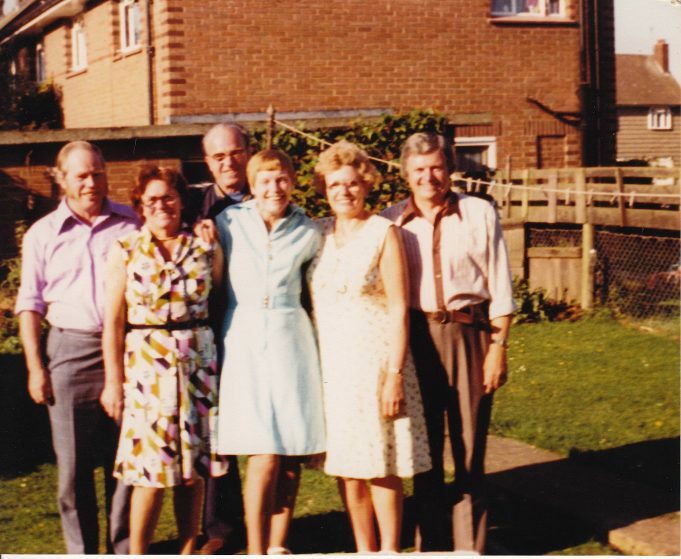 This next Photo is of 6 of my brothers and sisters taken I believe in the early 1980s (the 4 missing are a sister Gladys living in South Africa, a brother Eddie living in Cornwall, a sister Margaret who died in 1947 aged 16 and me Jim) sadly all deceased except Lott and Me. 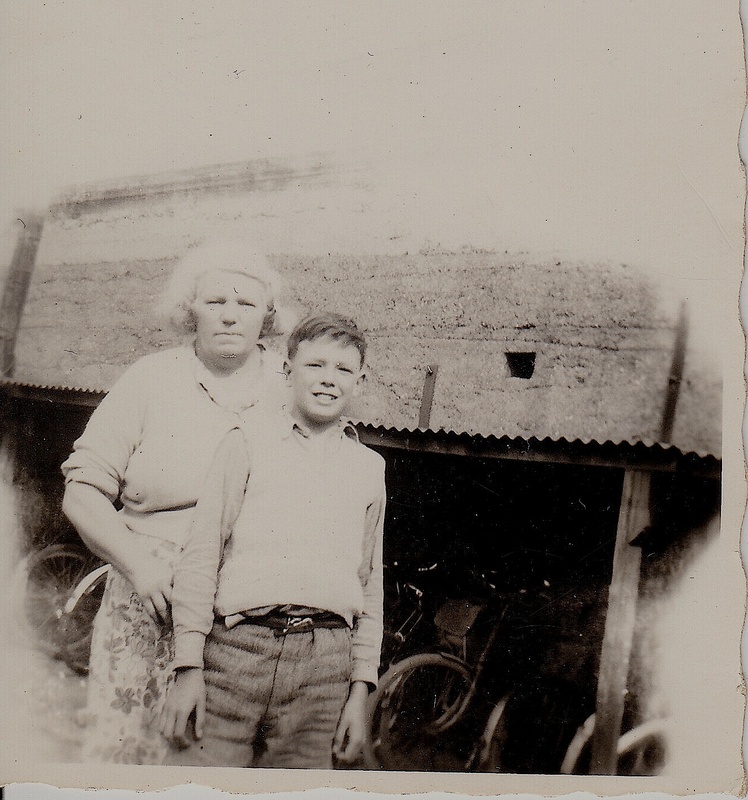 Lastly for now is a photo of my mother and me taken in the back garden of 13A High Road, Laindon when I was about ten, note the bicycle shed in the background for commuters to leave their bikes before going to London and the back of a brick built building which was the slaughter house for Lagden’s the butchers at number 11 High Road. (mentioned in the butchers stories on this web site). I was in a class with a redhead Mrs Quinton in a de-mountable classroom (as it was called then). I had the board rubber thrown at me, but it missed, lucky me! I remember having to use a pencil until your writing improved, then you were given a fountain pen! I made such a mess! I was made to go back to the pencil! The Headmaster at the time was……. Mr Green? There was a Mr Knott and before in the infants, Mrs Baker? I remember a few names of the pupils at the time, Edward Galloway, Ian Gray, Richard Saldana (lived with his Gran top of the road running alongside the Infants side?) erm….. David Bridgeman, I think he lived in Devonshire Road, we used to play in the underground garages! I think we played kiss chase with… Joanna Broader/Broder, Jill Clark and Sue Green? I was in the school play having to do Albert and the lion? I couldn’t put the deck chair up before singing ‘I do like to be beside the seaside’ and a parent in the front row laughed so much he fell off his chair! We used a large metal fireguard for the lions cage! Is this family related to Sally (?) Quinton who taught at Millhouse Junior school. The brilliant artist, mural painter, six foot fiery redhead. I nearly got whacked by her, along with Darren Andrews(?) when we spent the whole afternoon drawing breasts in each others exercise books as she did the Christmas mural for the school play. It really didn’t go down well with her feminist credentials. Scary! Hi, this is random but my name is Sarah and I am your great niece. My dad is your namesake. He is Arthur’s second eldest Son. I found this while searching for my dad on Google as a joke. Then I saw this and saw a picture of Grandad. Just wanted to say hello and hope you and your family are well. Thank you for putting the picture of Grandad and his siblings, it was wonderful to see this new photo of him and of my great grandmother. Phillip Sargeant is the missing person next to Peter Baker in the front row. He now lives in Ascot and working in Dubai. David, thanks for correcting your name (I thought it was David, but then got confused, what with David Carter as well) do you know the missing name. Are you still in Laindon ? 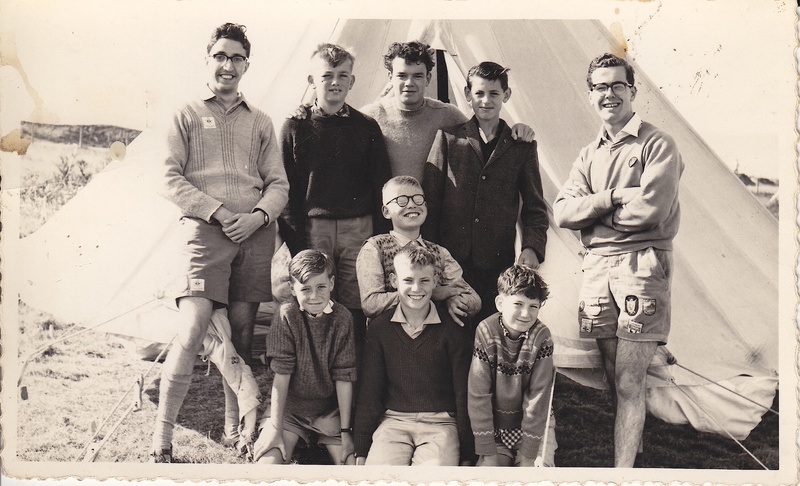 The chap on the camp photograph extreme right rear is David Shearcroft not Alan Shearer. Editor: Thank you David, correction made on your behalf. I can remember playing football with one of the Quinton boys whom I believe was Steve. It was the Laindon British Legion team. Other members were Alan Crabb and his brother and Tommy Winkworth. While I can picture some more of the faces, their names escape me. One thing I clearly remember was that in those days, amateur clubs received an allocation of two cup final tickets and I won one in the draw, but I was persuaded to give up the ticket in order to play in that Saturday’s game. I believe the ticket was raffled to raise some funds for the club, which may possibly have contravened the rules of issue. Perhaps there is a statute of limitations which govern such irregularities. Thank you Jean for your comments, Lott is alive, but not too well (she is in her late 80s and is wearing out) and now lives in sheltered accommodation at the top of Tavistock Road (called Guiness Trust I think!). I look forward to seeing you again at Laindon Library sometime. Hi Jim, I can remember you from school, I am pretty sure we were in the same class together at some point at LHR. I always envied you your large family, as although I had a brother and sister they were 8 and 11 years older than me. It always made me feel an only child, as they were both married by the time I was eleven. I used to imagine your family at Christmas times. Hope you are well, Kind regards. Mr Diment mentioned the surname Winkworth – I believe there was a girl with that name at our school (Frances maybe?) I must look now to see if I can spot her in any of the photographs. Editor: There was A Winkworth family that lived at the corner of Third Avenue and Lower Dunton Road. I beleive one of the daughters was named Frances. Hi Jim, nice that you remember my family, if you ever get to see Lott or could get a message to her. Please remember me to her and give her my best wishes. I now live in Suffolk and don’t get to Laindon now as most of the family have gone. But hope to get to the library sometime, so may see you. Nice photos Jim especially the last one – the snake belt brings back memories for a lot of us I bet. Jim; glad you got this together at last! Oh your mum, just as I remember her, bless her and wasn’t your Gladys so much like her. This brings back all those lovely memories. I have described somewhere else on this site, I liked visiting your house and discovering that lovely playroom etc. I do remember playing over the back of 13A too, loads of room for us kids to have fun. It was good to catch up with you again last year. Hi Jim It is nice to read your notes. My Mum was Harriet Quinton before her marriage to my father (Bert Pattle). I don’t know if you remember them, as we lived next door to Lott at 60 King Edward Road. Would love to know how Lott is. I can remember your mum from way back.